To the right of the picture-frame in Plate 3G will be seen an interesting design for a double candle-stick, which can be constructed entirely with hand-tools. The candle-holders proper consist of short sections of 1 1/2" cylinder, or they could also be turned from solid rod on the lathe, or else the bottoms must be plugged with small pieces of the same color material. The balance of the construction job consists only of cutting off, polishing and bending the three pieces shown, and cementing them together. The two ends of the 3/8" piece of sheet forming the bracket should be filed so that they are level after bending, as shown, and one of the two cross-pieces forming the feet is slightly longer than the other, to compensate for the fact that one passes over the other. The entire beauty of this design depends on making perfectly symmetrical bends. These can be made up in countless variety from sheet as well as cylinder stock, although most of the round boxes are much more easily made with a lathe than by hand, since the principal work in making a box from cylinder is the cutting-off and groove-cutting, which can be done more accurately and quickly with a lathe. Square boxes made from sheet however require only cutting off, polishing and cementing, and the devising of a handle and any other ornamentation. Several suggested types are shown in Plate 3L. Some of these boxes are all-plastics, others are plastics cemented to a wood lining, others have a wooden bottom or top. Ornaments consist of polished metal screws, bits of plastics in contrasting colors, cut-outs, inlays, metal or plastics knobs, and so on. The tops are usually loose, with rabbetted edge, permitting the top to set down into the box about . Corners are usually mitered, sometimes not, and are occasionally covered with a sort of molding made by rabbetting a corner out of a piece of round or square rod. Any heavy block of material left over, from 3" square on up, may be easily made up into a very beautiful desk pen-set, one very striking example of which is shown in Plate 2Y and sketched in Figure 32. Standard screw-type pen fittings are used, secured from a cheap or broken set, or they can be bought from fountain-pen dealers and supply houses. Size, finish and ornamentation can follow along any lines suggested by the imagination or limited by the materials on hand. The design shown in the illustration consists of a 5/8" block, 3 1/2" square, with the pen-holding screw passing thru a "washer" made of black plastics 1 3/8" round and thick, and the light-colored band toward the front is a piece of 3/16" sheet set into a groove filed in the block. The mottled colors such as natural onyx, jade, clouded amber, blue marble, carnelian and so on are most appropriate for this type of article. 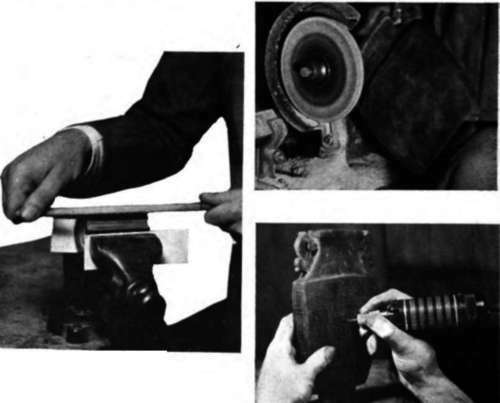 Another simple design is shown in Plate 3G, and a lathe-turned job in Figure 62. PLATE 3E. A wide variety of the better grade of bracelets and other Items. At top, the two-tone effect Is secured by cementing materia's of contrasting; colors together, and working: them as a whole. 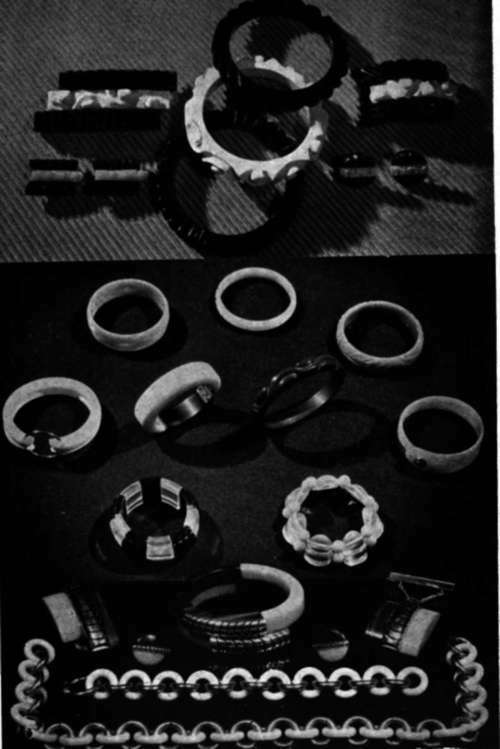 In the center are two types of bracelets using metal fittings. The black-and-white is made of alternating cemented sections, while the cat-crystal consists of turned and carved pieces strung on wire. 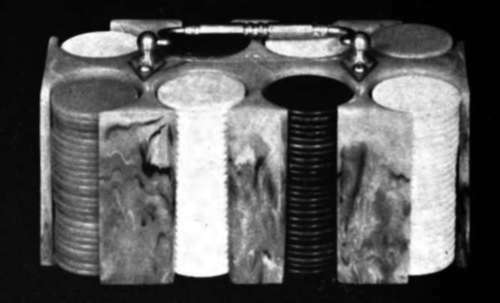 Below, rings are turned from tube, sawed thru diagonally, assembled and cemented together to obtain this effect. The lower set also shows a fine example of the combination of rare woods with plastics (clip, pendant and bracelet). PLATE 3G. (Above). 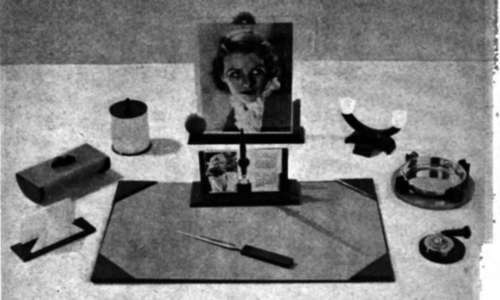 A group of plastic projects, including the candle-stick described in Project 22, the penholder in Project 23, the ash-trsy in Project 13. the picture frame in Project 17, the trump-coaster in Project 16, the cigarette-tray in Project 24 and the letter-holder in Project 21. PLATE 3H. (Below). The poker-chip rack made from a single special cssting, described in Project 14. The handle can be either conventional drawer-pull hardware, or designed from plsstics snd cemented. PLATE 3J. (Above). 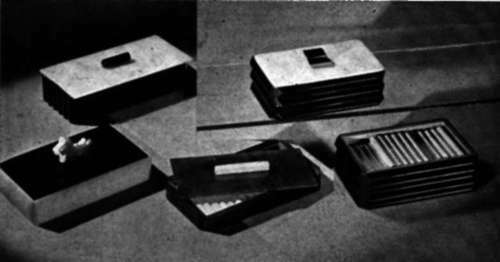 The serving-trays made from thin sheet stock, described in Project 18. PLATE 3K. (Below). 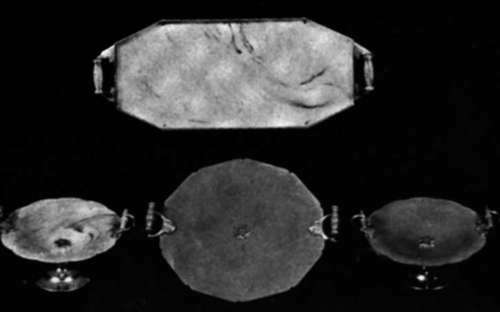 Current examples of plastics used as handles or ornamentation for handbags. Project No. 20. PLATE 3L. (Above). 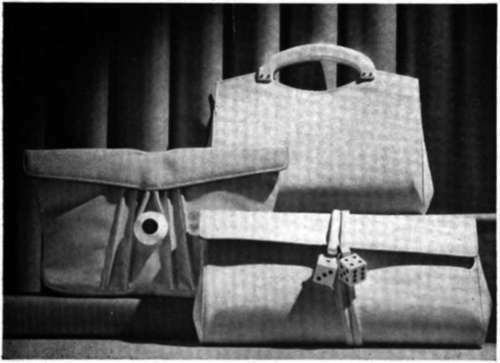 Various types of boxes made from sheet, plain and ribbed, with handles made from rod and Seattle-shapes. PLATE 3N. (Lower left). Filing the grooves in the Onyx .Lamp described in Project 25, using a rat-tail tile and protecting the material by using sheets of blotting paper in the vise. PLATE 30. (Right). A coarse carborundum grinding-wheel with a rounded edge does fast rough-carving and shaping work... The lamp in Project 27 was shaped in this msnner, as shown, and the fine-carving was done with a high-speed electric hand-grinder. Piste 3P, below. Photo of finished lamp on later page, (Plate 3R).